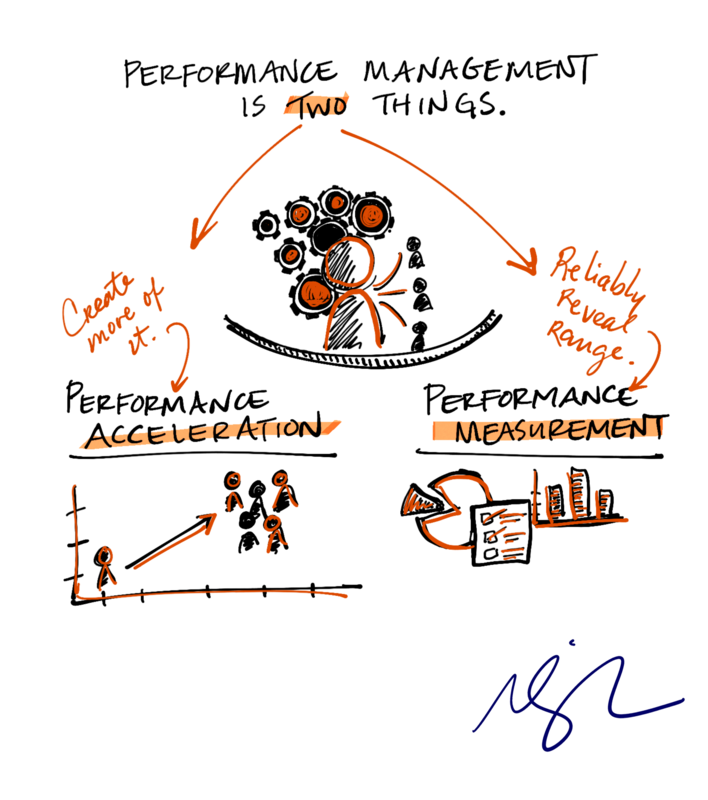 Performance management is made up of two very different systems, and you have to understand each one before you can solve both. The first aspect is performance acceleration: how do team leaders get more performance from their team members? The solution is not a feedback system or a goal alignment system. Goals and feedback don’t help us solve the problem of how do you do more, better work next week — they don’t accelerate performance. The solution is actually pretty straightforward: the team leader talking to the team member about near-term future work. The second part of performance management is performance measurement: how do we reliably measure the differential levels of performance of every single team member within the organization? Ratings don’t do this, because humans are unreliable raters of each other. Goals don’t do this, either. Performance acceleration and performance measurement are two distinct challenges. Click To TweetPerformance acceleration and performance measurement are two distinct challenges, and if you try to solve both problems with the same tool — whether that’s goals, feedback, ratings, or competencies — you end up doing both acceleration and measurement badly. We need to separate them out and solve each problem individually – that’s the only way to solve them both well. And when do we hear what will work for performance measurement? Or is this the Billy Crystal thing where I have to figure it out. Lol! Are you working on a new book that will tell me exactly what I should do? I need help in the worst way. I work with civil and structural engineers-a mix of all generations. I removed ratings last year and went the way of self evaluation and an oral review and received feedback saying the younger staff need the ratings back. I like the idea of constant check-ins (is this the solution?) but I just don’t see it ever working. Potential mentors are too over worked and don’t have time. Suggestions? Hi Kelly. Thank you so much for watching and for your comment. There is a solution that is founded on these principles and it was developed out of frustration that no one in our space has created HR tools to solve real world problems. Go to tmbc.com and my team can help you learn more. I really like this train of thought. In big corporations it is very difficult to change the way we think on performance ratings and goals. But, as a functional head, I think I can modify how I do these things. I just need to work more on how to incorporate them into the way I communicate to my team and how I walk them through this new way of thinking. Bob, you are in such a unique position for change! Do you have frequent, one-on-one, conversations with your team members? And do you and your team focus on your strengths, rather than your weaknesses? Marcus, Thanks for your advice. How can we accelerate the performance in finance teams? Marcus, recently at the Global Leadership Summit during your talk on Reinventing Performance Management you used a grid with 8 questions dealing with purpose, excellence, support and future with half in the “we” category and the others in the “me” category. You mentioned that these were available on your website but I can not locate them. Where could I find this resource? Also, thanks for the inspiring talk during the Summit. Marcus, I just heard you speak at the Leadership Summit last week also. You have re-inspired me! I’d love to see the grid and the pie chart with the rater inaccuracy percent’s also. Thank you! Thank you for this powerful resource. I’m looking for the “We” and “Me” categories you shared at the Global Leadership Summit. I want to share these categories with my direct report. Where can I find them?